Oil on panel, 39 x 57 cm. A bright light falls upon a band of merry peasants in an otherwise dark farm house. At the centre of the scene sits a satisfied peasant, while his wife to his right firmly grips her beer mug. Behind them, a fiddler is struggling to tune his violin – much to the amusement of the man next to him. A boy sits on the dirty floor, totally unaffected by the spectacle unfolding around him. Instead, his attention is focused on the farm dog that he is gently petting. Although the artist behind this painting is not known, the influence from Adriaen van Ostade’s early genre paintings is clearly evident in both the idiom and content. 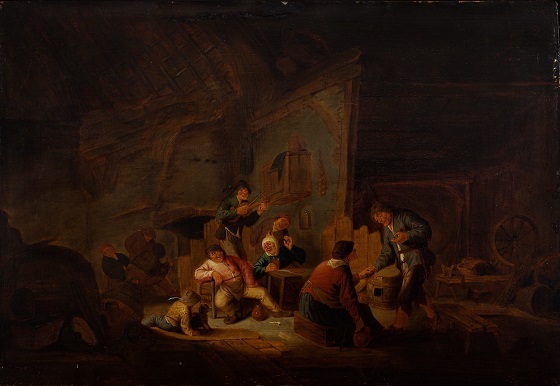 Both the strong lighting and humoristic depiction of simple-minded peasants engaged in merrymaking is a recurring theme in van Ostade’s genre paintings from the first half of the 17th Century.